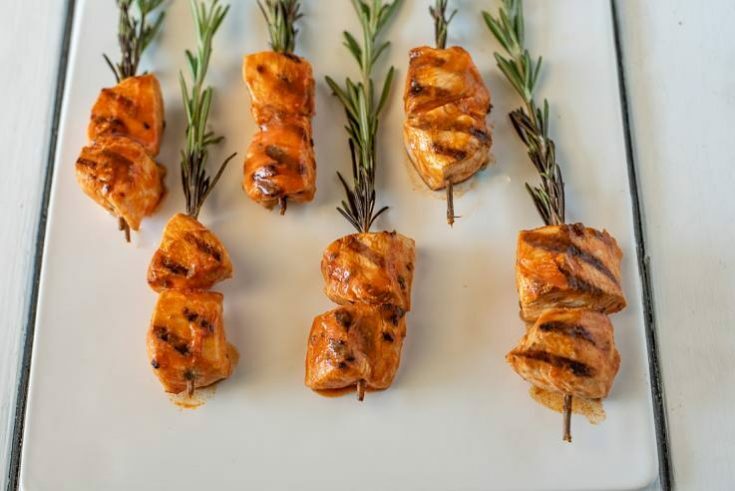 These Buffalo Rosemary Chicken Skewers are marinated in buffalo rosemary sauce and skewered onto fresh rosemary sprigs for a pretty presentation. Best served with blue cheese dipping sauce. This is an easy chicken skewers/kabob recipe that is a little something different. 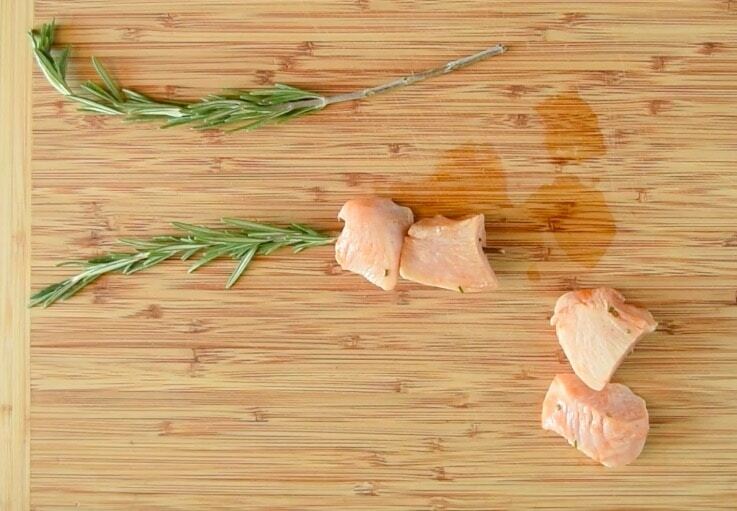 Since they are skewered onto rosemary, rosemary is also used in the buffalo chicken marinade and sauce. This is when I discovered that buffalo sauce works really well with fresh rosemary. In fact, I would go as far to say that you can pair most herbs with buffalo sauce. This buffalo chicken was not always destined to be skewered onto rosemary. When I was removing the rosemary leaves from the rosemary sprigs to chop it for the sauce, it occurred to me the thick branches would make really good skewers. I was all set to use my regular metal skewers but decided this would transform the presentation. I think it really does. At that point I had to re-think the grilling method because the rosemary would burn up faster than a brush fire, so I decided to use my indoor grill pan. This actually turned out fine because the chicken cooks so quickly it seemed a waste to fire up the outdoor grill. Place the chicken on the edge of the grill so the rosemary hangs off. 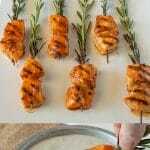 If it’s winter or you don’t have an stovetop grill you can cook these buffalo rosemary chicken skewers in the broiler. Cover the rosemary with foil and broil 4 inches from the heat on each side until they brown, about 4 minutes. Wrap the rosemary in foil to prevent burning. Do I have to use rosemary as the skewer? You can use regular metal or wooden skewers. Just remember to soak wooden skewers before grilling on the outdoor grill, but you wont get the rosemary infusion or any ooh’s and aah’s from your family or guests, just sayin’. What goes better with buffalo sauce than blue cheese? 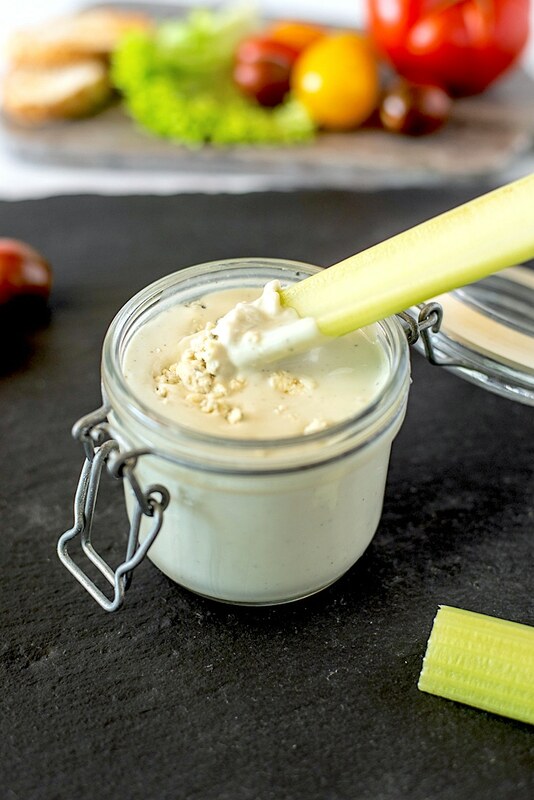 I have the best and easiest recipe for chunky blue cheese dressing. You can click on the text to be taken to the recipe or see the link and picture below. The perfect dip for these grilled chicken skewers. A great side dish to pair with the chicken skewers is roasted beet and grilled corn salad. To a bowl add hot sauce, apple juice, melted butter and chopped rosemary. Whisk to mix well. Add the chicken pieces to a ziptop bag (or container with a lid) and pour 2/3 of the sauce over the chicken. The rest of the sauce will be used to baste the chicken while it grills. Mix the chicken and sauce well, seal and refrigerate for at least 1 hour, up to 24 hours. When the chicken has marinated, skewer 2 pieces of chicken per rosemary sprig. 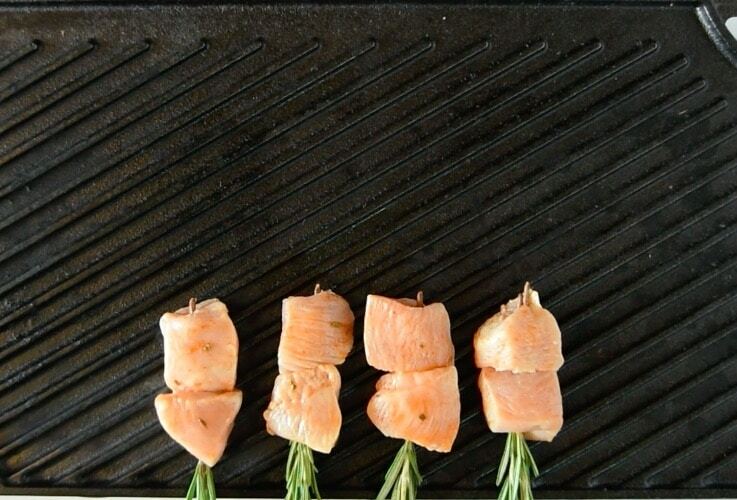 Place the skewers onto a preheated grill (with the rosemary hanging off the side so it doesn’t burn) and grill for 4 minutes. Turn and brush the chicken with the sauce. When they are done, brush all over with the sauce before serving. If you’ve tried these Buffalo Rosemary Chicken Skewers or any other recipe on the blog then don’t forget to rate the recipe and let me know how you got on in the comments below. I love to hear from my readers! You can also FOLLOW ME on FACEBOOK, TWITTER, INSTAGRAM and PINTEREST to see daily recipe updates. Classic buffalo chicken is skewered onto fresh rosemary sprigs for a pretty presentation and little infusion of rosemary, served with a delicious blue cheese dipping sauce. Remove about 1/3 of the rosemary from the end of the sprigs. Finely chop the rosemary for the sauce. 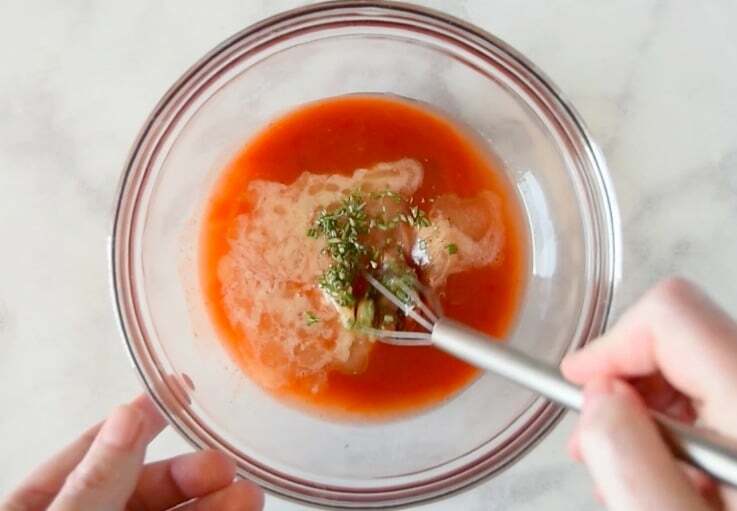 To a mixing bowl, add the hot sauce, apple juice, melted butter and chopped rosemary, mix well. 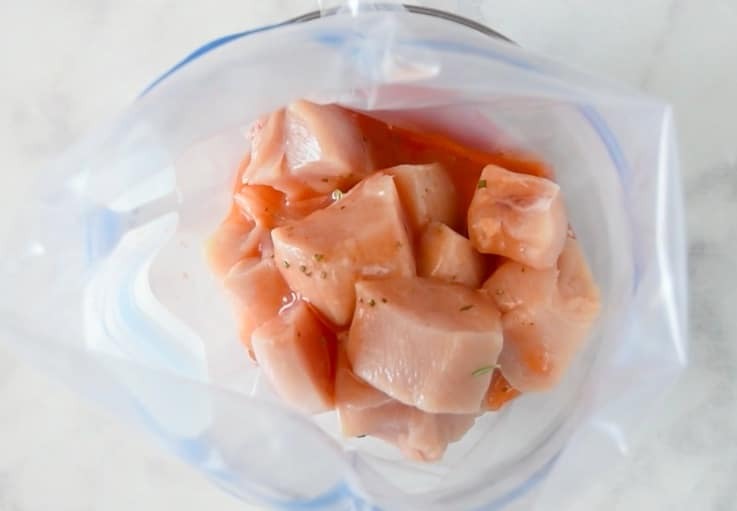 Add the chicken to a sealable bag or dish with a lid. Pour 2/3 of the hot sauce mixture over the chicken and mix well. Seal and refrigerate for 1 hour up to 24 hours. Set the other 1/3 of the sauce aside. Once the chicken has marinated, pat the pieces dry with a paper towel. Take a sprig of the rosemary and skewer the 2 pieces of chicken, repeat with the rest of the chicken. Brush the chicken with olive oil and grill. Turn the chicken after 2 minutes and brush the grilled side with reserved hot sauce (do not use the marinade). When the chicken is cooked on the second side transfer to a plate and brush with more hot sauce. Serve hot with blue cheese dressing. Wow. This is very creative. I bet the rosemary lends great flavor to these chicken kebobs. . I love this presentation! What a great recipe for cookouts or even a quick meal for the weekends. These are gorgeous! They’d be perfect for a party! So cute! I would love serving these at my next party! These look delicious! I’m always looking for ways to use our huge rosemary plant before it overtakes our garden. I’d love to have a garden with a rosemary plant. I love this idea!! I have a huge rosemary plant…guess what I am going to be trying! I’m pinning this too because I addicted to buffalo chicken…so delicious! I’d love it if you had a chance to swing by our Foodie Fridays and link this one up…either way though I am pinning and stumbling!! Happy Friday! Yum! 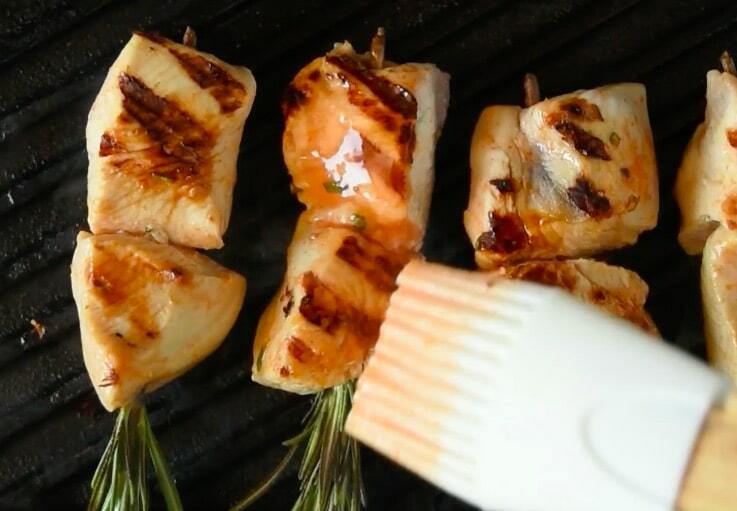 These look delicious and so pretty with the rosemary skewers! Stopped by from the Weekend Social and am definitely pinning! What a great flavor profile you have created for this chicken dish! Love the use of fresh rosemary sprigs as the skewer! Your rosemary chicken recipe looks both very refreshing and tasty. I need to try this very soon! Fantastic job with this post! Thanks for sharing! 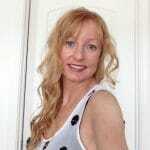 Rosemary is my favorite herb… this looks so wonderful Janette! These are beautiful. I love Buffalo style things. I bet I could do this with cauliflower instead of chicken. hmmm…. Thanks for sharing your recipe. I love buffalo chicken, so I was excited to see a new way to make it! I love using fresh herbs, so this is going to be something I try soon.